Kenny's Tile is your home remodeling experts in Overland Park. Professional installation and guaranteed quality is included with every customer order. We are your Overland Park headquarters for beautiful flooring products, bathroom fixtures, staircases, home remodeling, carpeting and even countertops. We offer the most complete line of high-quality tile and stone flooring, and we install hardwood floors in your Overland Park home using our own team of experienced finishers. Our company also performs repair work on appliances and older floor surfaces. We are truly your one-stop home improvement specialists. Every home has its own distinct atmosphere, and choosing the appropriate floor covering can be a bit tricky. We invite all of our Overland Park neighbors to visit our showroom and check out the complete line of ceramic, travertine and granite tiles for use on floors and countertops. Every type of tile has been thoroughly inspected for quality, and we stock nearly every shade of ceramic and granite. 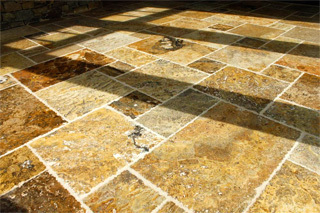 Stone tiles can be polished or honed for the perfect look and reflectivity desired by the customer. Kenny's Tile is your professional for hardwood floor refinishing in the Overland Park, KS area. A refinished hardwood floor can breathe new life into your home. Kenny's has been serving the Overland Park area for years, so we have experience with the proper way to refinish a hardwood floor. We use a dustless refinishing system, which will eliminate the mess that is usually associated with a hardwood flooring project. We also offer a wide variety of stain colors, which are on display in our showroom. Our expert will even come to your home to provide a free estimate and show you the choices you have regarding new stain colors for your hardwood refinishing project. Call us today, and we'll be happy to talk to you about refinishing the hardwood floors in your Overland Park home. Kenny's also has a carpet division that can install any style you need for your Overland Park home. With many colors to choose from, our carpet department can help you select the type that is best for your home. We offer professional carpet installation, and our showroom carries a wide range of textures. From saxony to frieze to plush, Kenny's Carpet can help you create a new look for your home. Our carpet installation crews work directly for us, so we can always provide the very best in quality craftsmanship. We offer our Overland Park customers a free inspection of your home, and our field representatives take the time to sit down with you and discuss all options. At Kenny's Tile, making a quick buck is not our goal. We strive for 100 percent customer satisfaction, and to accomplish this we offer free estimates and no up-front costs for any of our home improvement projects. You can also visit our showroom, which is located just minutes from Overland Park at 3303 Main Street in Grandview. We have one of the largest warehouses of in-stock tile and granite in the Overland Park area.